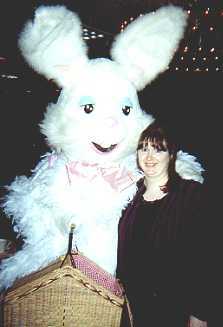 Home-schooled in industrial macramé and elevator button repair, Sandra (pictured here with a former client) eventually realized un succès fou as Easter Island's most sought-after hare dresser before giving it all up to work as a Dispeller of Computer Demons and Purveyor of Technical Know-How somewhere inside the Beltway. Paid only in expired Blockbuster coupons, her sole comfort is the minor fame she enjoys as a tournament-class smartass in assorted humor contests. Sandra's goals include winning the "Least Competitive" ribbon at all costs, trading licks with her #1 guitar hero, Stephen Stills, and trading wedgies with her #2 guitar hero, Tommy Smothers.